Your hair is singed from all the times you clipped your own wings just to make someone else happy. Your fingertips, blistered from all the times you forgot about your own needs and gave away what was meant to be yours. Even your voice has been touched by the flame, no longer strong, but shaking and raspy from all the times you wanted to say no, but said yes. You have set yourself on fire to keep others warm, but inside your soul is shivering. Your soul shivers with all the coldness of being forgotten, untouched, and unloved by you. It’s such an easy thing to get caught up in. You give too much to others, and you are the one left standing out in the cold. You get your value from how much you give to others, rather than by how much you give to yourself. You give too much at the expense of yourself. You do this because you are afraid to look inward, to make the jump, to do what you should to create your own life. Oh, you have promised yourself you will do it eventually. When the kids are older, when you have more time, when you are retired. When others don’t need you. You have promised and promised, and now you are holding the final match. Dear one, your soul can’t take it any longer. It’s begging you and pleading with you. Your body has been dissolved by the fire. Must you burn your soul, too? They taught you that your feelings and your needs were unimportant, and so you abandoned yourself. It’s no wonder you don’t feel like it’s safe to be with yourself. You are afraid to acknowledge what you want out of life, what your needs are. It’s time to change that. Take that last match, strike it, and shine the light on the dusty cobwebs of your heart. It’s time to find a need of your own each day and to honor it. Each day do something just for you. Don’t let anything or anyone stand in the way. Allow healing for yourself. Start listening to what your soul is craving. And do that. Get to know yourself. Listen to your complaints, your fears, and your sadness and honor that, too. Become your own friend. Take that lost self gently by the hand and take it out to play. Let your self trust you again so your true self will emerge from the shadows, and then next? Watch as you set the whole world on fire. The fireworks will be worth it all, I promise. I also want to offer a free 15-minute Skype session (1 per person) to anyone who wants help figuring out what their own needs are and how to honor them. Email me at yourownlifejourney@gmail.com for your free session today. Cool one! Thanks for the nice read. You’re right. I am NOT required to sacrifice my happiness for others. I CHOOSE to do so. I will suffer any pain to make sure others are happy. I will willingly burn so that others do not have to, and I will do it to the day I die. “Why?” you might ask, because in this world of selfishness, someone has to. 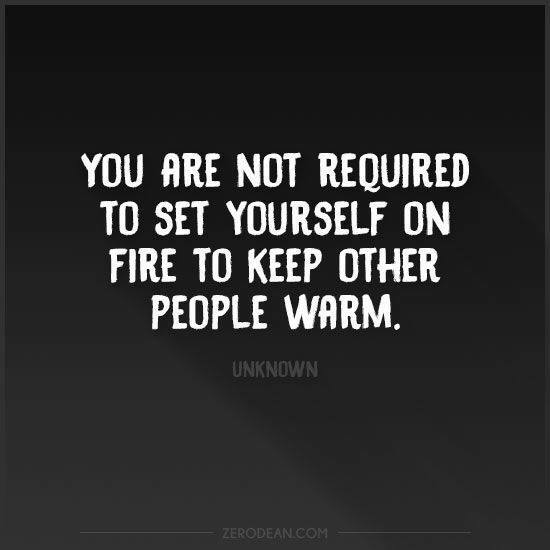 But, if you burn, then you aren’t there to continue helping others. My point is not to burn out. Many people go beyond the limits they should to make others happy. We have to give to ourselves before we can be there to help others! I choose to do all I can work with those in need while taking care of myself. If I don’t take care of myself I’m no good to anyone. I want to light up not burn out. Thanks for the positive piece, Valen. Great stuff — of which I needed to be reminded. Thanks, again. 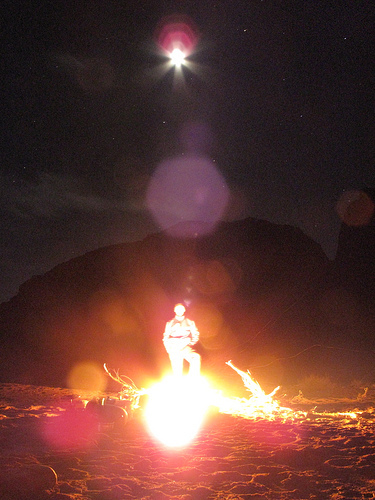 Metaphorically speaking, however, someone set fire with passion for life WILL live warmly and meaningfully. I am glad you liked it, Stan. Love the joke!! Here’s to all of us finding our passion! I think you are hitting on the dichotomy surrounding the evolutionary social aspect of our survival. On the one hand it has been only through the social interaction and, arguably, the empathetic and altruistic nature of our being that we have survived so successfully. This had led to a tipping point where we are now facing the emergence of the individual within our overcrowded planet which is forcing us to break away from the socially constructed society, the successful society, and begin to take the risk of defining ourselves as individuals, perhaps in an attempt to split the societal organism and establish a new, better one that will compete with the older model and allow the progression of life to continue. Maybe we are here, at this tipping point, where the desire to individualize is overcoming the power of societal conformity based solely on the success of that society and the biological realist ion that it cannot survive in the form that it exists and a new paradigm must emerge. I find myself in a position that I don’t know what to do about. I had children relatively late in life. I’ve done many things, but always with an eye towards family. Now my children are independent and my wife, who is far different than I am, has a life outside our house. I don’t. Fact is, without being needed, I am naught / not. I no longer find any real joy or reason to continue. I’m tired. I’m really ready to not be any more. What are you passionate about? Do you want to travel? What if you also created your own life with your own hobbies and interests?